Dave Wolfenden on a partnership sealed purely by mutual benefit between pistol shrimps and gobies â€” and how you can set up your marine tank to foster that special relationship. For those of a scientific persuasion, it’s generally frowned on to assign human behaviour to animals. However, when watching the shrimp gobies and their little crustacean partners, it’s difficult not to! Anyone who’s kept them in an aquarium or seen them in the wild will know what I mean. The slightly neurotic, ultra-clingy shrimp keeps in constant tactile contact with the goby — which often has a slightly exasperated demeanour. It suggests a somewhat dysfunctional relationship. However, it’s a highly effective partnership, being found in more than 100 species of goby — and it’s possible to replicate such a fascinating relationship in your aquarium. Several pistol or 'snapping' shrimps of the genus Alpheus associate with gobies, primarily in the Indo-Pacific in areas of sand and rubble in relatively shallow water of the coral reef. The shrimp has notoriously poor eyesight, but is good at constructing and maintaining a burrow. In fact, it may be obsessed with it, constantly shifting rubble and debris from which it is made to keep the entrance clear. The goby, meanwhile, has particularly good vision, but is less adept at creating burrows which, of course, offer valuable protection on the reef. In an evolutionary masterstroke, both shrimp and goby have evolved an alliance which utilises the strengths of each — or makes each one’s weaknesses less of a hindrance, depending how you look at it. In return for 'lodgings', the goby acts as a sentinel to the shrimp. The pair use tactile communication virtually constantly. 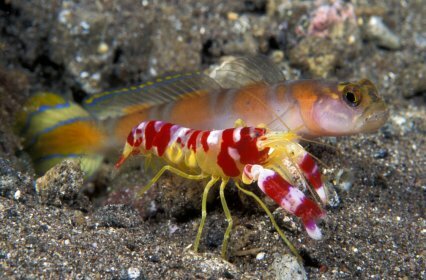 The shrimp maintains contact with the goby, courtesy of its long, highly sensitive antennae, while the goby primarily uses subtle movements of its tail to warn the shrimp if danger is imminent. Often pairs of gobies or pistol shrimps will inhabit the same burrow. The animals tend to be diurnal — daytime active — and the shrimp will often seal the entrance to the burrow at night to shut out predators. This is a truly mutualistic example of symbiosis – meaning both partners benefit from the deal. In fact it appears to be, for many goby species, an obligate relationship on the reef. In other words, they have to exist in partnership with their respective shrimp(s) due to their vulnerability to predation. Many species of shrimp goby are always with their crustacean 'landlord'. A study undertaken last year by Californian researchers revealed, through DNA analysis techniques, that the shrimp-goby partnership has twice evolved independently, involving different major groups of goby during each evolutionary event. Gobies of the following genera are noted as having symbioses with shrimp: Amblyeleotris, Ctenogobiops, Cryptocentrus, Stonogobiops, Vanderhorstia, Tomiamichthys and Mahidolia. Several species of shrimp goby are actually offered in the trade. The shrimps are relatively difficult to capture, so less frequently offered. Primarily, the gobies on offer will include Stonogobiops, Ctenogobiops, Cryptocentrus and Amblyeleotris species. Despite the intimate association between the shrimp and their feisty fishy lodgers on the reef, you can maintain the gobies on their own in the aquarium, providing they have suitable nooks and crannies to hide in. You’ll need to correctly identify the species of both shrimp and goby if a successful interspecific partnership is to be forged. Sometimes matched pairs are offered and these can be a decent bet, otherwise, research carefully! Both shrimp and goby should be kept in an appropriately furnished aquarium. Plenty of suitable substrate is vital for burrowing and overall a reef system is perfect, but there’s no reason why a dedicated system couldn’t be established specifically for this purpose. 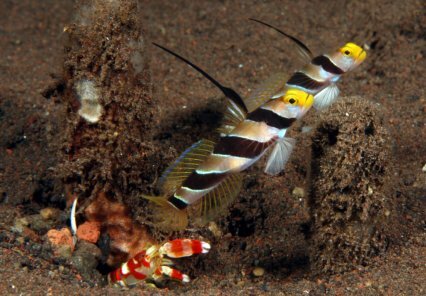 If housing a shrimp-goby partnership as part of an established system, ensure that tank mates are peaceful, as aggressive or even some semi-aggressive species will harass the goby and potentially out-compete it in the hunt for food. Otherwise, feeding for both shrimp and goby is straightforward. The goby will accept a wide range of live, fresh and prepared feeds. Frozen Mysis, Artemia and flake foods are usually eagerly accepted and feed at least twice a day. The shrimp tend to be scavengers, so will happily pick at any leftovers. The gobies, despite their diminutive size, tend to be territorial with conspecifics and even other members of the same genus. Limit stocking to just one goby and shrimp pair per aquarium, unless you have several hundred litres available. It’s sometimes possible to establish heterosexual pairs of gobies and 'mated pairs' may be occasionally offered. Otherwise, stick to one goby per genus. A shrimp and goby symbiotic pairing can, in fact, be ideal for nano aquariums, as 100l/22 gal is adequate for the smaller species. However, some burrows may be up to half a metre long, so adequate substrate area is important. The shrimp will need to have a substrate of some 10cm/4” in which to maintain its burrow and fine sand simply won’t cut it as this structure will readily collapse. The shrimp are good at building burrows, but not that good! Some fine sand is OK, but this needs to be mixed with various other coarser materials to allow a stable burrow to be built. Pieces of shell and coarse coral chips mixed in with the substrate are ideal. Why not take out your frustrations on some small pieces of live rock with a hammer? As well as being therapeutic, this can create instant rubble pieces which your shrimp will love. Both goby and shrimp need careful acclimatisation and may be quite shy for several days after being introduced, but disease issues should be rare. Keep water quality as good as possible, as it’s best to avoid having carrying out any disease treatments. The little gobies can be sensitive to many medications, so your mantra really needs to be ‘prevention is better than cure’. Pistol shrimps derive their name from their ability to produce loud popping noises from their specialised claws. Specifically, they create a high-speed cavitation bubble which creates a sound as it collapses. Some species can stun or even kill fish using this technique. However, while they can create sound, those which associate with gobies tend to be small and relatively peaceful. They certainly won’t be keeping you up all night! Stonogobiops species of goby are small and delicate, rarely reaching more than 7cm/2.8” and have a slender body. This genus includes the fantastically named and expensive S. dracula (Dracula goby) from the Indian Ocean, again reaching just 7cm. This species is very attractive, with alternate thick and thin bands of red-orange. S. xanthorhinica, at up to 6cm/2.4”, is one of the most regularly seen, hailing from a wide area of the Indo-Pacific. ‘Xanthorhinica’ means yellow nosed in reference to its bright facial marking. One of the most desirable members of this genus is S. yasha from the Western Pacific (pictured above and at the top of the page). Sporting beautiful red markings and growing to no more than 5cm/2”, this species aptly answers to the common name of the High-fin goby, and one look at its elongated dorsal will tell you why. They’re pricey but worth it. Ctenogobiops species include the high-fin Spangle goby (C. tangaroai) whose rather showbizzy name is derived from its iridescent, spotted markings. It reaches a diminutive 6cm/2.4” and hails from the Pacific Ocean. Cryptocentrus species include the Yellow watchman goby (C. cinctus,) a stout, chunky specimen from the Western Pacific, reaching some 10cm/4” in length and having a somewhat grouchy appearance. C. pavoninoides from Indonesia also known as the Blue spot goby, can attain 15cm/6” in the wild but is usually less in the aquarium. Exclusively from the Red Sea, the Harlequin goby (C. caeruleopunctatus) will reach similar lengths. Amblyeleotris species are generally slender and colourful. Randall’s goby (A. randalli) from the Western Pacific is one pretty fish, reaching no more than 12cm/4.7”, sporting a prominent dorsal fin and displaying bright orange stripes. Also from the Western Pacific, the Sunspot goby (A. guttata) reaches a similar size and displays distinctive orange spots across its body. The Aurora goby (A. aurora) from the Indian Ocean is a stunning specimen, reaching 10cm/4” and having bright red stripes and a gorgeously-marked caudal fin. Also worth a mention is Wheeler’s goby (A. wheeleri) from the Indo-Pacific. Reaching 10cm/4”, this fish is reminiscent of an old-fashioned barber’s pole with its alternate red and white stripes, often dotted with fine blue spots. Many symbiotic shrimp are often simply labelled 'Alpheus spp.' when appearing in retailers’ systems. It’s worth investigating if the Alpheus species you’re interested in is actually a symbiont with gobies. Some are not and often won’t like the idea of co-habiting with a fish! One of the best species and one of the most commonly seen is Randall’s shrimp (A. randalli), pictured above with Stonogobiops nematodes. This shrimp is transparent with vivid red stripes interspersed with white banding and yellow-green legs. This will readily associate with many species of goby, including many Stonogobiops, Cryptocentrus and Amblyeleotris species. While not the prettiest of shrimps, with brown markings, the Tiger pistol shrimp (A. bellulus) is sometimes offered and makes a good choice for pairing with several gobies. For example, it will act as a symbiont with C. cinctus, A. guttata, A. randalli and S. yasha, plus many more. Alpheus ochrostriatus, the Fine-striped shrimp, is another good bet and particularly attractive with delicate pink coloration and thin white stripes across the carapace. It pairs with, among others, C. tangaroai, A. guttata, A. randalli and A. wheeleri. Some species may live symbiotically with gobies if the mood takes them, but they may be primarily non-symbionts. Take the Bullseye shrimp, and it’s easy to see why A. soror (pictured here by Haplochromis, Creative Commons) commands a high price tag. It’s rarely offered in the trade but, when specimens become available, they’re quickly snapped up. One admiring look at its orange body, prominent false eyespot and those purple legs and claws will tell you that this is a particularly desirable species. Mixed results have been seen when attempting to pair this species with gobies — suggesting it’s a facultative symbiont rather than an obligate one. Appropriate pairings of shrimp and goby largely appears initiated and maintained through chemical cues. Some species of goby simply won’t act as tenant with certain species of shrimp. Some are less choosy than others, but, to avoid disappointment, research in advance whether the pairing you have in mind is a natural one — and positive ID of species is essential. Not all Alpheus act as symbionts. It’s possible to pair symbiotic species which would never encounter each other in the wild, but it can be hit or miss. For further guidance, Debelius and Baensch’s seminal Marine Atlas (Volume 1) is an excellent reference work for identifying the various species of both shrimp and goby.